Recently, I had the opportunity to try out a slightly lighter and significantly cheaper version of a 300 mm lens, lent to me by a friend. The lens in question was a Canon EF 300 mm f/4.0 L IS USM Lens. I was using it in conjecture with my trusty Canon EOS 5D Mark III coupled with Canon EF 1.4x III Extender. The resultant combination gave me 420 mm at f/5.6 along with some excellent Image stabilization. A 300 mm f/4.0 lens is a relatively lightweight lens at 1,190 gm, along with being quite sturdy. The 300 f/4 is one of two current Canon lenses that have a built-in retractable lens hood (the Canon EF 400 mm f/5.6 L USM Lens being the other). Image stabilization allows the Canon 300 IS to be handheld at a much lower shutter speed -2 stops lower, than is normal. The Canon EF 300 mm f/4 L IS USM Lens is able to focus down relatively close to the subject on hand; 1.5 m for a 0.24x maximum magnification. This is not a 1:1 ratio macro lens like my 100 mm lens, but is quite a nice magnification. 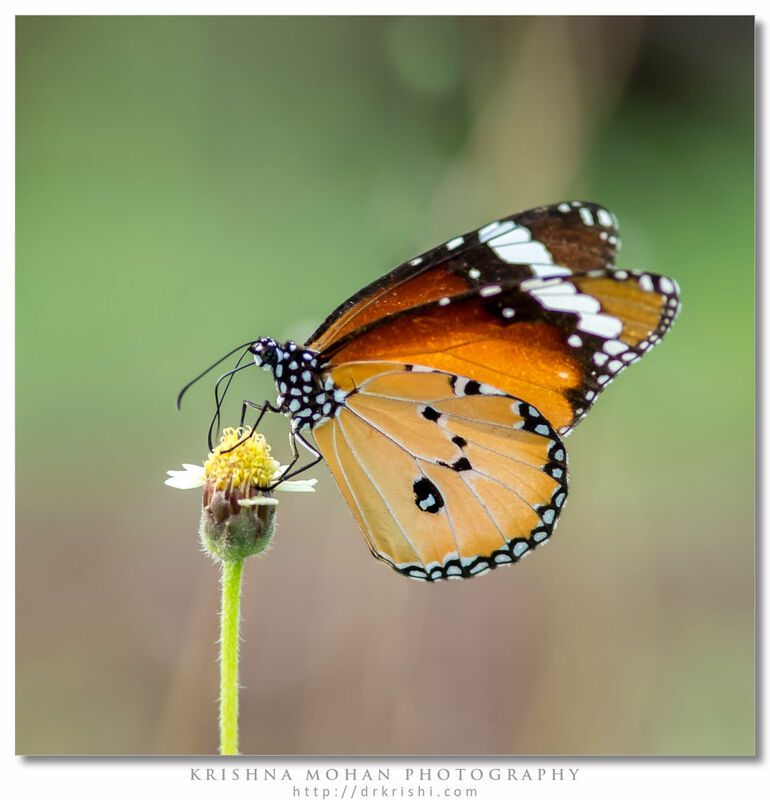 Plants, flowers and butterflies make for ideal subjects when utilizing this lens. Extension tubes extend the maximum magnification a small amount – to .30 x and .37 x for 12 mm and 25 mm tubes, respectively. The extenders do not affect the MFD (Minimum Focus Distance) of the lens they are mounted behind, so the MM (Maximum Magnification) of the lens is also increased by 1.4x. 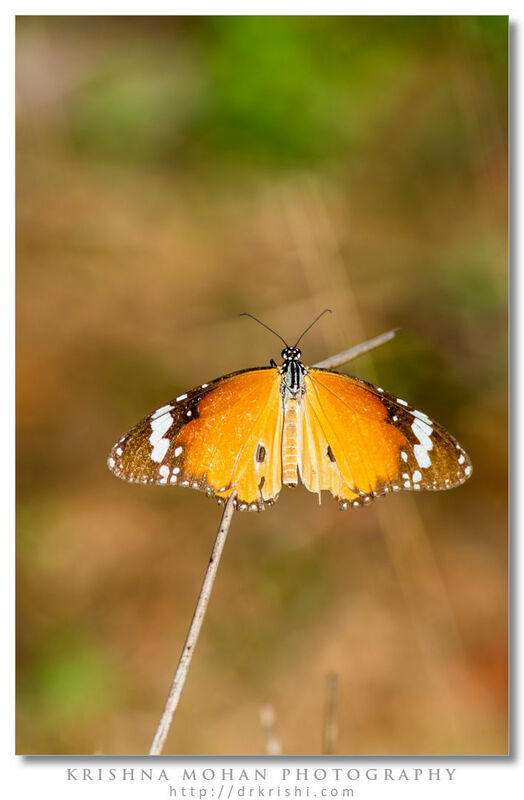 While testing the abilities of this rig, I perchanced upon this handsome Plain Tiger butterfly (Danaus chrysippus), basking on a dried shrub. 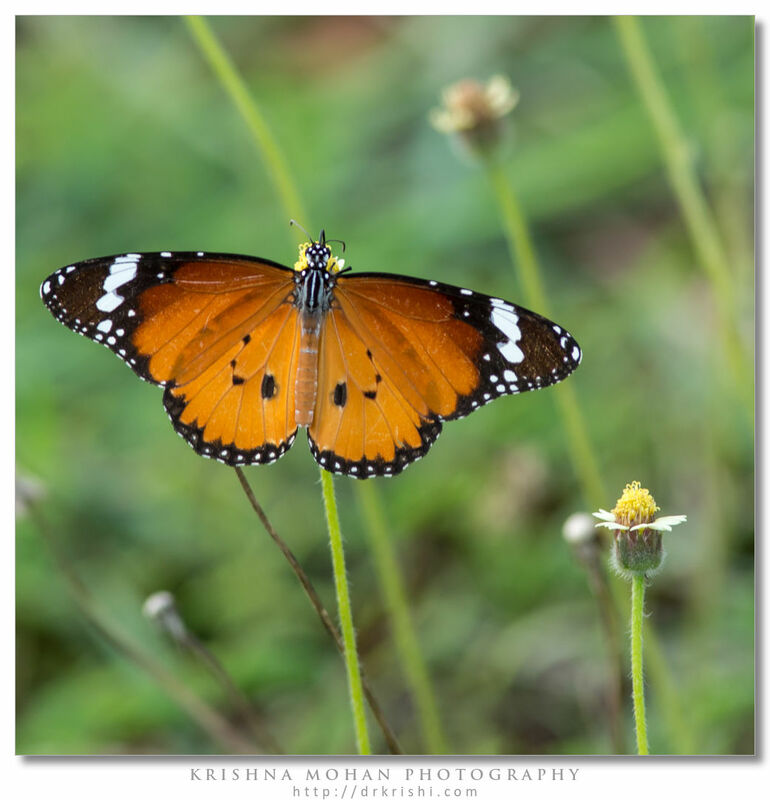 The Plain Tiger is a strikingly colored, medium sized butterfly with a wingspan ranging from 6 to 8 cm. The body is a rich black, with multiple white spots. The wings are tawny, the upper side being brighter and richer than the underside. The apical half of the fore wing is black with a white band. The hind wing has 3 black spots around the center and a thin border of black, enclosing a series of semicircular white spots. The background color and extent of white on the fore-wings varies somewhat across the species wide range. The Male Plain Tiger is smaller and more brightly colored, possessing a pair of specialized pouches,one on each hind-wing. The area bearing these pouches is white, thickly bordered with black and bulging slightly. The pouches are essentially clusters of specialized scent scales, used to attract the female. Additionally, males also possess two brush-like organs which secrete a specialized pheromone, essential during courtship. 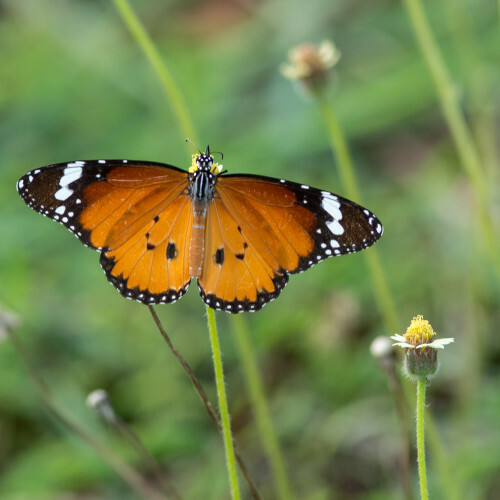 The Plain Tiger is widely distributed, ranging from Africa and southern Europe, eastwards through Sri Lanka, India, and Myanmar to China and the Sulawesi. It is a common species, being perhaps the commonest and most well studied of the Indian Danaine and is a familiar sight on the subcontinent. 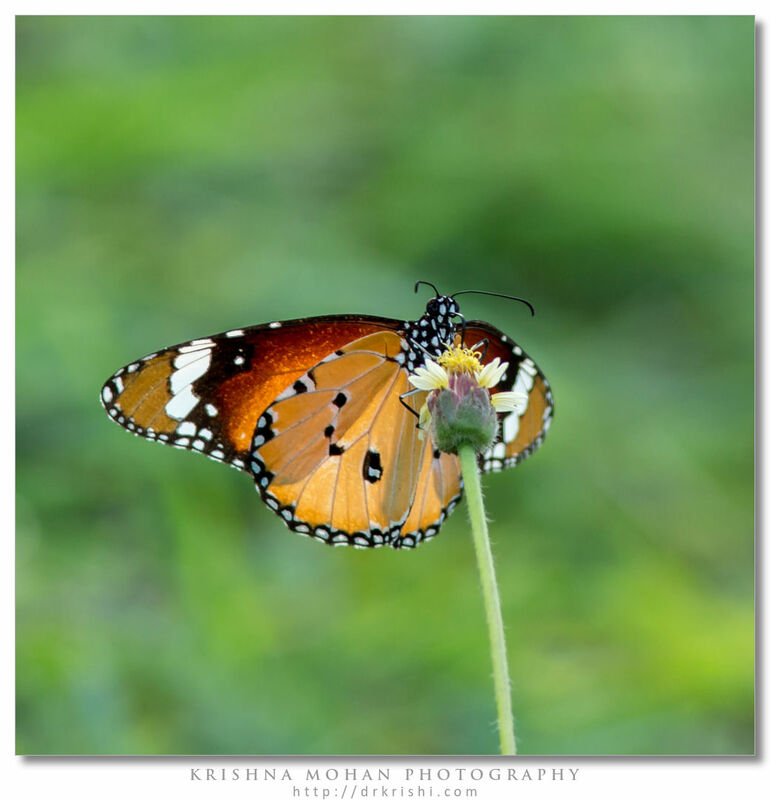 It flies from dawn to dusk, frequenting gardens, sipping from flowers and, later in the day, fluttering low over bushes to find a resting place for the night. 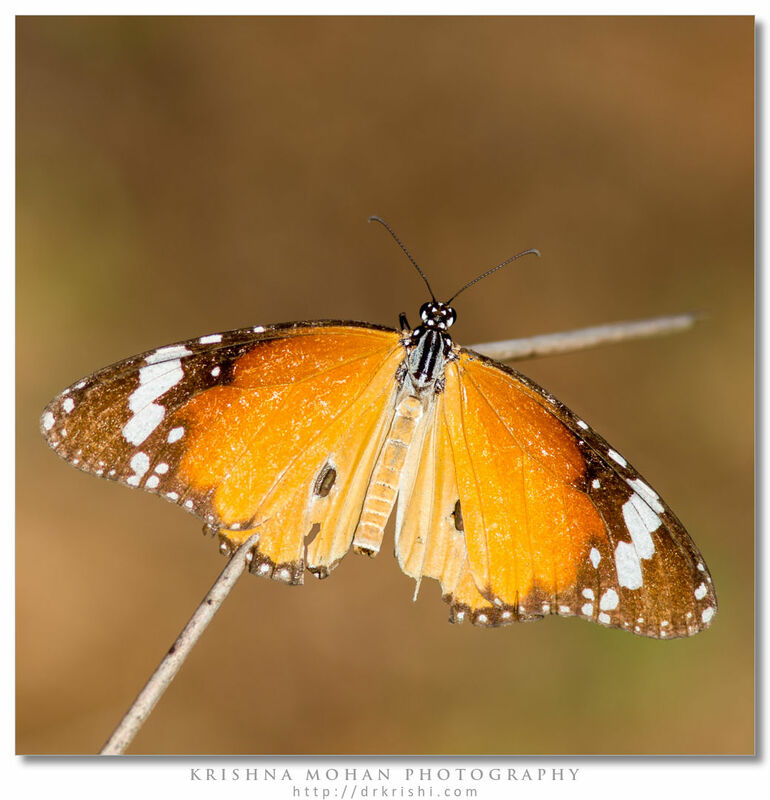 As is usual for diurnal butterflies, the species rests with its wings closed. 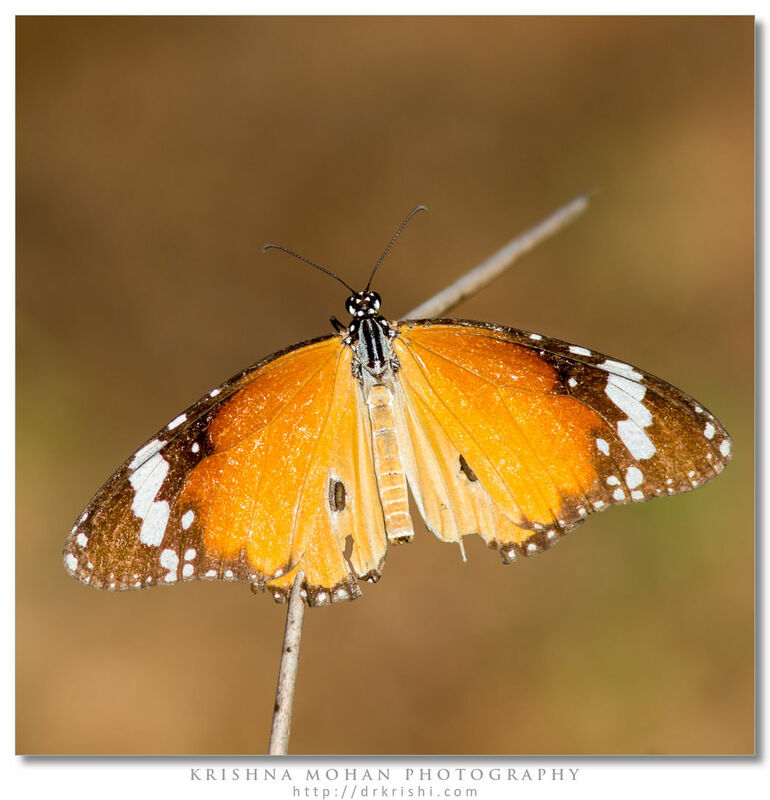 While basking, it prefers sitting close to the ground, back to the sun, wings outstretched and exposed to the sun’s rays. 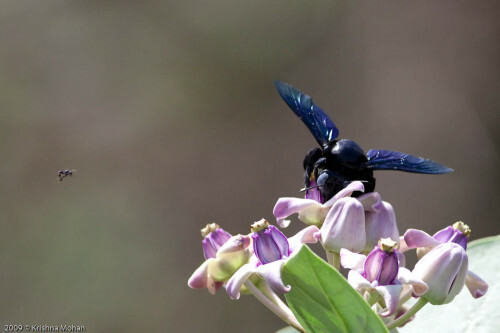 The species is protected from the onslaught of most predators, such as birds, owing to the presence of unpalatable alkaloids ingested and imbibed from host plants, during the larval stage. The adult therefore flies slowly and leisurely, generally close to the ground and in a straight line. This gives a would-be predator ample time to recognize it’s bright, warning colors and avoid attacking it. Inexperienced predators attacking the butterfly, soon learn to give the species a wide berth, as the alkaloid laced body induces vomiting. 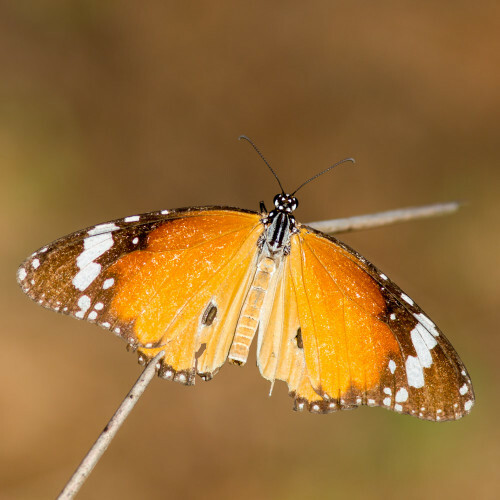 Additionally, the butterfly also possesses a tough, leathery skin to survive such occasional attacks. On being attacked it is not averse to playing possum, while oozing a nauseating, rank smelling, terrible tasting liquid. 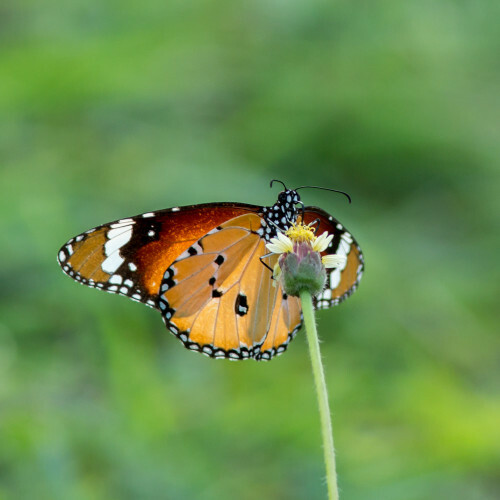 This endeavor on the butterfly’s part ensures it’s rapid release from a predator’s clutches. 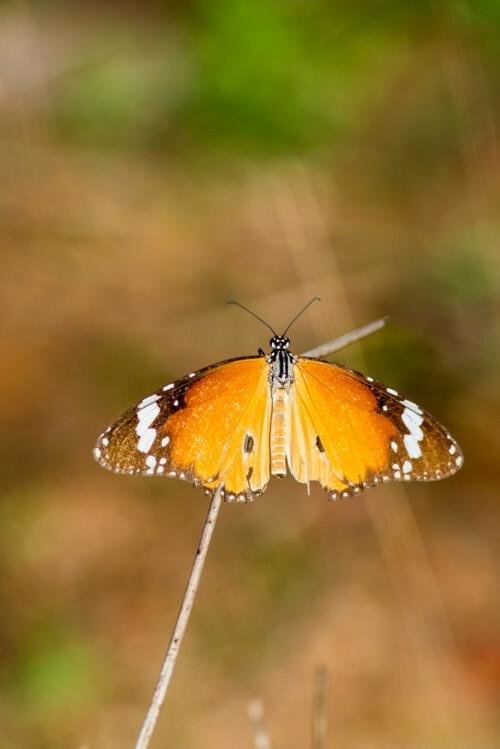 The species thus ‘miraculously’ recovers from attacks that would kill most other butterflies. 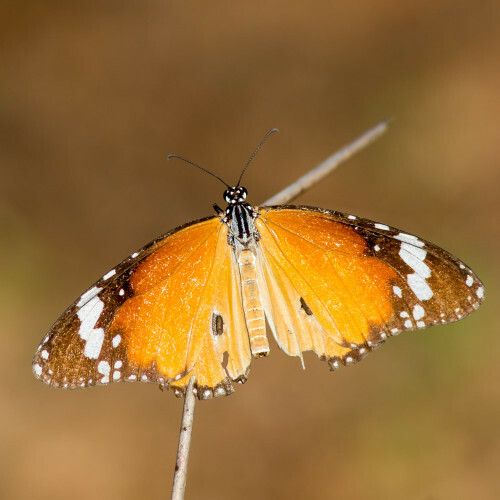 This protection mechanisms of the Plain Tiger, as of other danaines, and indeed, of all colorful and unpalatable butterflies, result in predators learning this memorable aspect at first hand. 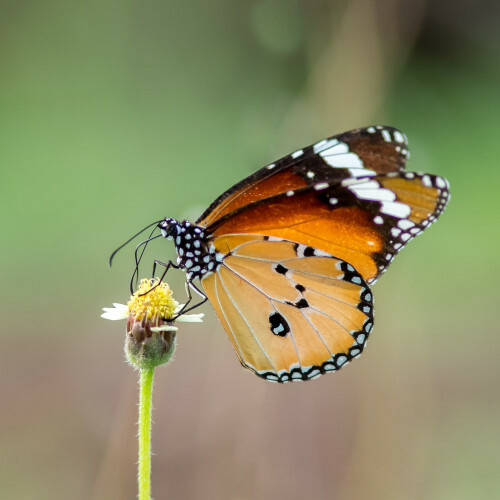 Predators soon learn to associate the patterns and habits of such butterfly species with unpalatability and avoid hunting them, at all costs, no matter how starved or desperate, leading to a large number of ‘edible’ species, often called “mimics”, evolving to resemble the ‘inedible’ butterflies, which are referred to as the “model”. The resemblance is not only in color, shapes, and markings, but also in behavioral and flight patterns. This form of mimicry, where an edible species mimics an inedible species – is known as Batesian mimicry. Danaid Eggfly (Hypolimnas misippus forma inaria) females. EXIF info - Aperture : ƒ/5.6 | Camera : Canon EOS 5D Mark III | Taken : 9 June, 2013 | Flash fired : no | Focal length : 420mm | ISO : 400 | Location : 12° 55.3451′ 0″ N 74° 51.989′ 0″ E | Shutter speed : 1/200s | Images and content Copyright © Krishna Mohan. Please contact me to purchase prints or for image publication license. EXIF info - Aperture : ƒ/7.1 | Camera : Canon EOS 5D Mark III | Taken : 9 June, 2013 | Flash fired : no | Focal length : 420mm | ISO : 400 | Location : 12° 55.3451′ 0″ N 74° 51.989′ 0″ E | Shutter speed : 1/500s | Images and content Copyright © Krishna Mohan. Please contact me to purchase prints or for image publication license. EXIF info - Aperture : ƒ/8 | Camera : Canon EOS 5D Mark III | Taken : 9 June, 2013 | Flash fired : no | Focal length : 420mm | ISO : 400 | Location : 12° 55.3451′ 0″ N 74° 51.989′ 0″ E | Shutter speed : 1/200s | Images and content Copyright © Krishna Mohan. Please contact me to purchase prints or for image publication license.